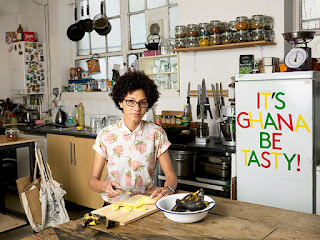 NEW YORK (CBS NEWS)--Chef Zoe Adjonyoh was born in England to an Irish mother and a Ghanaian father. She loved the foods of her father's homeland and taught herself how to prepare them. After a batch of peanut soup offered up at an arts festival was such a hit, she opened London restaurant Zoe's Ghana Kitchen. That's also the title of her new debut cookbook. Adjonyoh is being honored at the annual Iconoclast Dinner Experience at the James Beard House in New York Saturday along with other trailblazing chefs and beverage professionals of color from around the world. 1. Mix all the ingredients for the dry spice mix together in a bowl. Store in airtight container in a cool, dark place, or in the fridge if made with peanut butter, and use within a few months. 2. Combine suya spice mix and caramelized red onion together and shape into a burger patty. 1. Heat a heavy-based saucepan, then add the oil and fry the onions over a medium heat for 2-3 minutes until translucent. 2. Add the garlic, guinea peppers, ginger, thyme or rosemary (if using) and chilies and fry together for a few minutes. Stir in the tomato purée and chicken stock until the mixture has formed a thick paste. Then pour in the chili powder and continue cooking and stirring for a further 10 minutes. 3. Finally, add the prawn/shrimp or crayfish and smoked fish powder, then cook over a low heat for 30 minutes, stirring almost continuously to prevent the mixture sticking to base of the pan. The oil will rise to the surface when the sauce is ready. Taste and adjust the seasoning if necessary. You can choose to blend the sauce with a stick blender or leave it unblended for a coarser texture. Leave to cool, then spoon into sterilized jars. There should be plenty of oil on top of the sauce once it's cooked, so make sure there is a layer about 1cm (1/2 inch) thick in each jar. But if there is not enough, pour in extra oil to cover. Seal the jars and store in the fridge for up to a month. 1. Place all the chale sauce ingredients in a blender and blend together until you have a smooth paste. 2. Use straight away or leave to cool and store in an airtight container in the fridge for up to 3 days, or freeze for future use.Heat the groundnut oil in a heavy-based saucepan, add the onion and sauté over a medium heat for 2 minutes. Stir in the chili powder and curry powder, then add the garlic, ginger, Scotch bonnet, crushed peanuts, sea salt and black pepper and stir well - lots of punchy aroma should be rising from the pot at this point. 3. Stir in the vegetable stock and bring to the boil, then reduce the heat and simmer for about 15-20 minutes or until stock reduces by half. Add the chale sauce and cook for a further 50 mins. 4. Add the peanut butter 1 tablespoon at a time while stirring until it has all dissolved, then use a stick blender to blend all the ingredients to a smooth consistency. 5. Add the whole pierced kpakpo shito chillies to the sauce and leave to simmer over a low heat for at least a further 60 minutes before serving, or leave to cool and then store in an airtight container in the fridge for up to 5 days. 1. Boil the beans in salted water until tender - you should be able to squeeze them easily between thumb and forefinger - if using tinned beans drain and rinse and set aside. In the heavy-based pan heat the oil until melts. 2. Add the diced onion + ginger + chili flakes + scotch bonnet and sauté until onion is translucent 2-3 minutes should do it then add the curry and chilli powder and stir well. 3. When all is golden add chopped plum tomatoes + tomato puree + salt + pepper and stir through - leave to cook on medium heat for 30 mins or until tomatoes start to break down - if you want a smooth sauce blend at this point. 4. Add the cooked or drained beans and turn down to a low-medium heat, stir through occasionally so the beans don't stick to bottom of pan - cook for a further 30-40 mins on a low heat until beans are tender and tartness of tomatoes has dissipated. 5. Check seasoning before serving in bowl with some gari sprinkled on top and a side of fried plantain. 1. Peel the avocados, remove the pit and cube the flesh. 2. Finely dice all the remaining ingredients and mix together in a bowl with a fork - try to keep the avocado in cubes rather than mashed. 3. Garnish with fresh herbs and chili and / or chopped pistachio or roasted nuts with a pinch of ground hot pepper and sea salt. 3. Take off heat and remove from foil when ready to serve and corn is lightly charred on all sides. 1. Activate yeast with warm water. Add all ingredients together. Mix well. Keep somewhere warm to allow to leaven for a few hours. Store in fridge. The consistency should be like a drop scone or thick pancake. 2. Heat oil to fry in a heavy based pan - moisten clean hands with water and scoop out 1 tbsp of mix at a time and pinch into a ball - gently drop into hot oil, repeat for quantity desired. Balls should quickly rise to surface golden brown all over - remove from oil and drain before rolling in cinnamon sugar to serve. 1. Put the sugar and water in a pan, on a gentle low heat. 2. Lean and quarter the strawberries, then add the sugar and mash it all together on a low heat and keep stirring gently. After 5 minutes, add the chili flakes and scotch bonnets and salt and keep cooking until the jam thickens to desired consistency, approx 5-6 minutes.